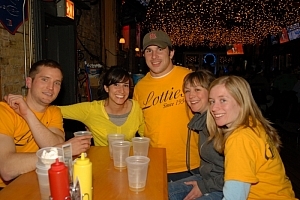 Teams compete to “One-Up” their opponent’s bar tab on Game Nights. Teams with the highest “Winning” bar tab at the end of each month win a FREE 2-hour Team Party! Status updates each week We will sponsor ANY and ALL sports/activities. FREE Trivia on Mondays and Tuesdays. Flip Cup available Wednesday and Thursday. Perks for coming to Lottie's!